Come and spend quality time with your family and the residents of Bickford Place, a senior living community near Holy Cross. On the 4th Sunday of each month, our religious education families are invited to come interact with the residents from 3 to 4:30 pm. Bring a book to read to a resident, bring a game, sit and visit, or if you've got a skill, (magic, playing an instrument, singing), the people we visit with will be thankful to see you perform. VOLUNTEER HERE or call Maureen Goddard at (913) 522-4420. This is a great family activity that puts our faith into action. Observe Holy Week as a family. Become an Affirming Parent! Live Easter Joy each day! Experience God's springtime splendor with your children! Check out the latest issue of the CATHOLIC PARENTING NEWSLETTER / BOLETÍN CATÓLICO PARA PADRES. First Communion Masses at the Church of the Holy Cross will be celebrated the weekends of May 11-12 and May 18-19, 2019. 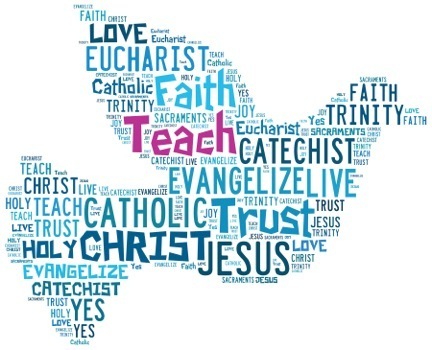 Open the link below and complete the form to select your First Communion Mass time. Please note that once 12 children are scheduled for a particular Mass, it will no longer be an available choice.